TBILISI, DFWatch — Russian police have published new evidence which seems to strengthen the case that Georgian politicians tried to foment social unrest in Russia. The evidence relates to the connections between the Russian opposition and the Georgian parliamentariann Givi Targamadze; a prominent member of President Saakashvili’s National Movement party. Targamadze has been chair of the parliamentary committee on defense and security issues. A few months ago, Russian media first reported about their possible connection between him and the Russian opposition. At the time, the National Movement party was in government; Targamadze’s party. The media reported that he promised the Russian opposition USD 35 per month to organize a revolution. Vladimir Markin recently stated that the investigation has revealed a number of important things regarding the organizing of social disorder in Russia. Evidence shows Georgian politician Givi Targamadze financed the actions of Sergey Udaltsov, leader of ‘the Left Front’, his assistant Leonid Razvizhayev and MP Konstantin Lebedev. Markin also remarked that in spring of 2012, citizens were sent to Lithuania from different regions in order to participate in a seminar, which had as a goal to gain government power following the example of the color revolutions in Kyrgyzstan (2005), Ukraine (2004) and Georgia (2003). Konstantin Lebedev and Leonid Razvizhayev, as well as their leader Sergey Udaltsov, were charged in October with organizing social disorder. According to the investigation, they were advised by Givi Targamadze and had planned to receive money from abroad. The Russian online news website Life News writes that they got records of negotiations between Targamadze and Russian opposition leaders. 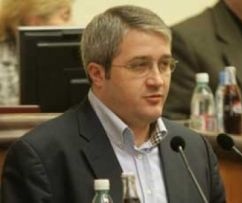 Evidence reveals that the spouse of Sergey Udaltsov was the main figure of the protest rallies in Russia, which was a demand of foreign sponsors of opposition representatives. Givi Targamadze has not commented on this issue.